Sunday for me means waking up really late and indulging in a super lazy breakfast. 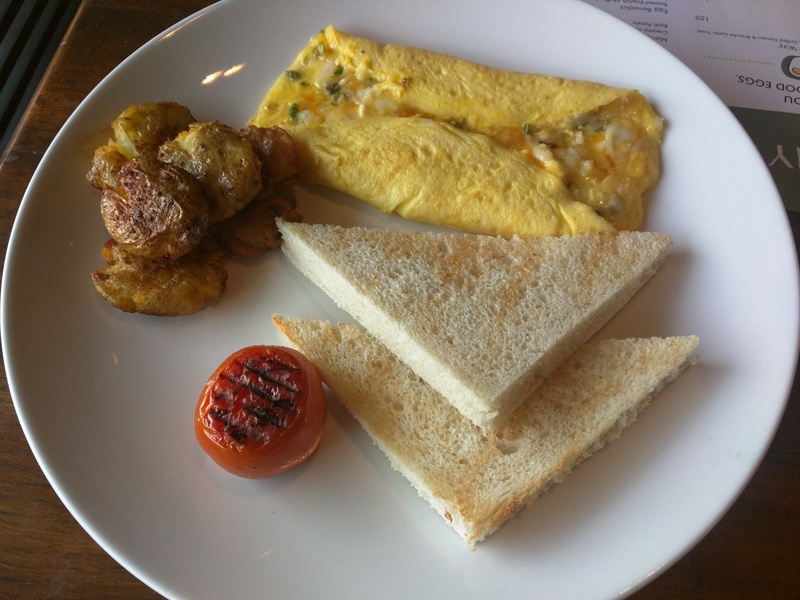 Till sometime back, Mumbai had very limited options for a leisurely brunch, until Cafe Mangii launched their superb breakfast menu – Wake Sunny Side Up. Café Mangii is a go-to place for me whenever I craved for something Italian and when I got to know about their breakfast menu, this was something I was looking forward to. 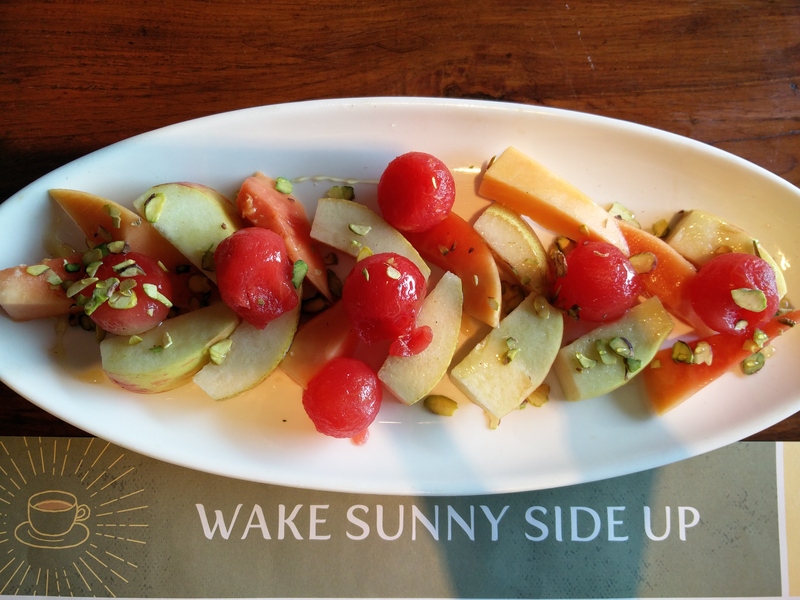 We started our breakfast with a Fruit Medley – A plate of honey-dipped fresh-cut fruits (watermelons, pears, papayas and apples) sprinkled with pistachios and cinnamon powder. The honey went really well with the cut fruits. The pistachios added a nice crunch and light cinnamon flavor added a twist. If nothing, this platter will make you feel healthy and good. While we waited for the next dish to arrive on our table, we were served with fresh fruit juices – they serve Pineapple, Watermelon and Orange juices. 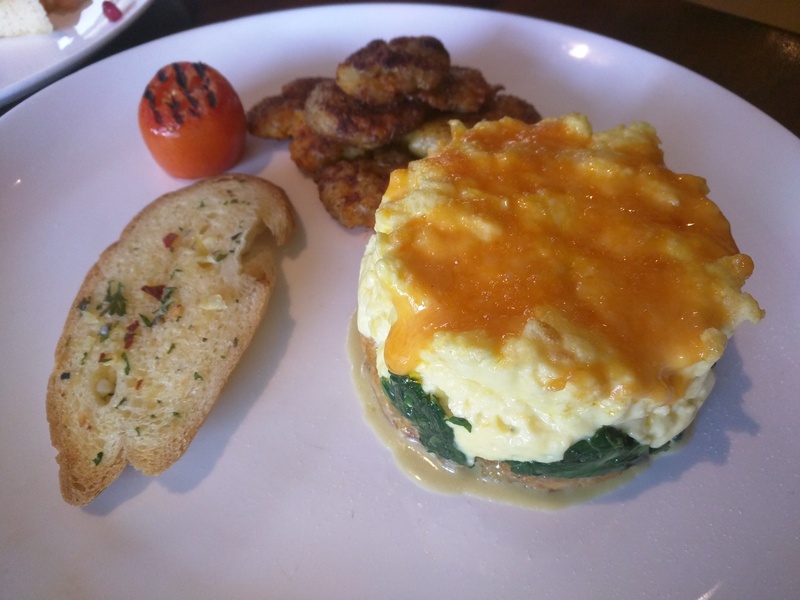 This was followed by the beautifully plated Mangii’s Egg Decker – Creamy Spinach & Truffle infused Scrambled Egg stacked over crisp Rosti Potato. The Egg Decker had so many layers with completely different textures, a total riot of flavors. The highlight of the dish for me was the perfectly spiced baby potato rosti, I couldn’t help but request for another serving. 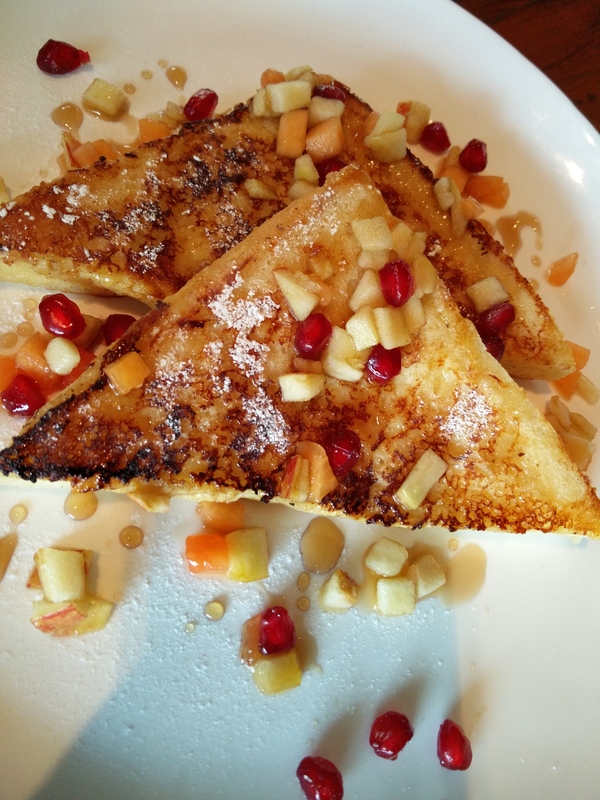 Next was the French Toast – Egg drenched Brioche, Maple Syrup & Berry Compote. I would have loved it if the toasted Brioches served were a little crispy. The sogginess also made the dish to be a little heavy on the palate. Though, what I really liked about the dish was that it wasn’t very sweet nor was very eggy. The Berry Compote added a nice twist to the dish. Within no time, our Chilli Cheese Molten (omelette) arrived on the table. The slightly runny omelette along went really well with the oozing cheese and slightly spicy taste of the chilies. With American Cheddar, Pepper Jack & Cream Cheese this was a total cheesy indulgence. I think, the chilli and cheese combination can never go wrong! This lazy breakfast was ended with a platter of Belgian Waffles. 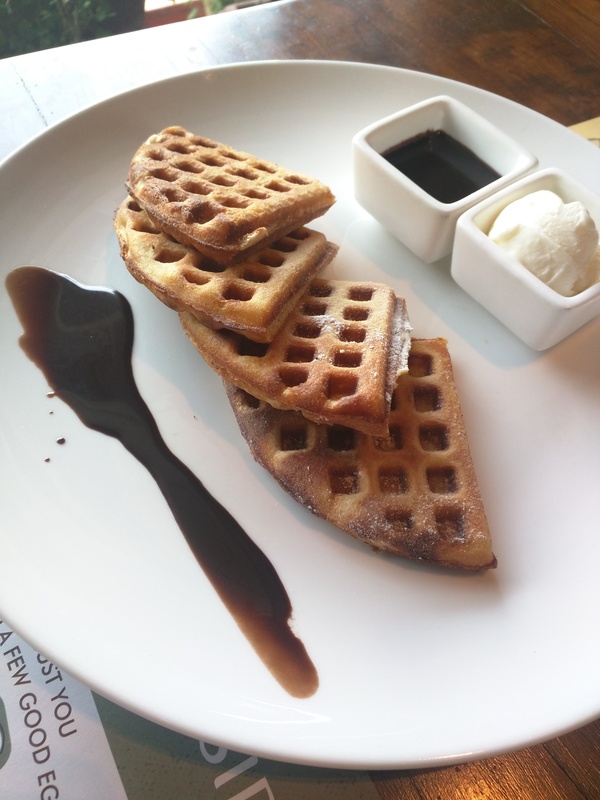 Our hot waffles were served with Chocolate Ganache and Vanilla Ice-cream. You can either go with this combination or ask for Nutella, Fresh Berry Compote or Whipped Cream. The waffles were as perfect as we expected it to be and went awesomely well with the rich Chocolate Ganache & Vanilla Ice-cream. A perfect end to the lazy Sunday breakfast indeed. All in all, I’m definitely going back to Café Mangii for the whole lazy Sunday breakfast experience. I definitely have my eyes on the dishes I didn’t try this time – specially the Classic Normandy – Poached Eggs, Smoked Salmon & Smeared Hollandaise. 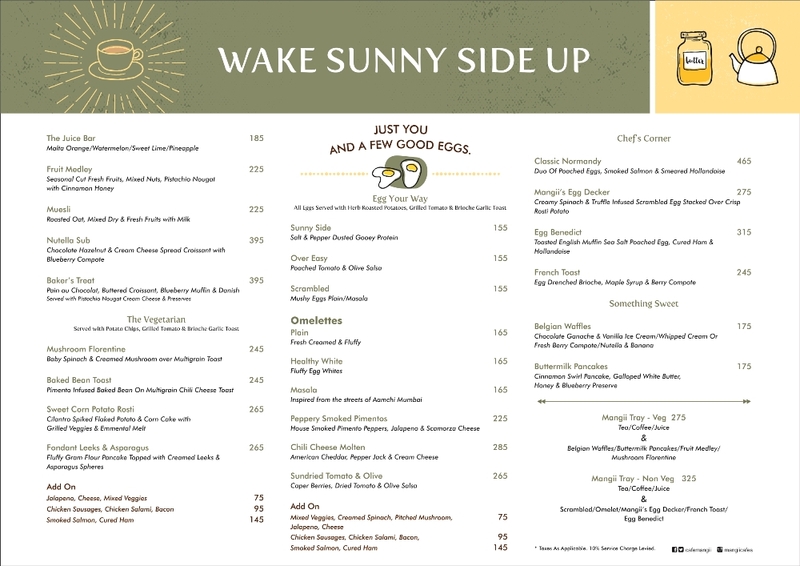 I highly recommend Café Mangii’s Wake Sunny Side Up menu to everyone who loves eggs for breakfast and to everyone who believe that Sunday breakfasts are supposed to be lazy like this one. ← Apple iPhone SE – Small Yet Powerful! But Is It Easy On The Pocket?